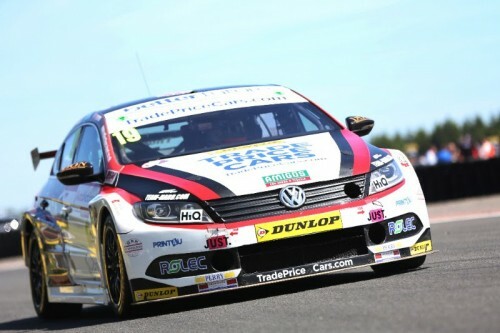 Dunlop MSA British Touring Car Championship rookie Bobby Thompson hasn’t let a torrid weekend at Knockhill dampen his spirits ahead of the penultimate weekend of the 2018 season at the Silverstone National Circuit, a track he says will give him and his #19 Team HARD with Trade Price Cars VW CC team their best chance to challenge for a podium this year. The 22 year-old Hornchurch based driver returned from his most recent outing of the BTCC’s record breaking 60th anniversary season with nothing to show for his efforts save for a very wet pair of race boots. However with only six races of this year’s 30-race calendar remaining, the 2017 VW Cup Series Champion is confident that the fast, flat and smooth layout of the 1.64-mile National Circuit at the home of British Motorsport, will suit his #19 VW perfectly. “Silverstone National is where I got my first ever podium in a car,” says the BRDC Rising Star, who was just 16 years of age when he shocked the Ford Fiesta Championship establishment with his 2013 podium finish around Silverstone National’s fast, sweeping layout that lends itself perfectly to the kind of slipstreaming that Thompson used en-route to a BTCC career best seventh place at Rockingham last month. “I’m not going to dwell on what happened at Knockhill but every weekend, good and bad is a massive learning experience for me. I went in to the weekend full of confidence and things obviously didn’t pan out like I had hoped but I’m not going to let one bad weekend affect how I approach these last two weekends. Thompson’s confidence has been boosted further by the return of race engineer Timo who missed Knockhill but who had previously helped guide the sleek #19 GKR Ltd backed VW to a brace of points finishes at Snetterton and ‘The Rock’ and the fact that in 2017 Thompson’s predecessor Mike Epps guided his VW to a pair of top ten finishes at Silverstone.